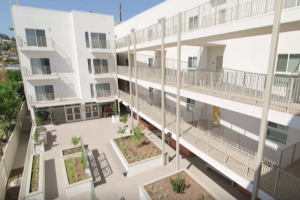 FSY Architects joined in celebrating construction completion of Teague Terrace, a 56-unit affordable housing development for homeless veterans, developmentally disabled and senior citizens. The celebration and blessing ceremony, which took place on November 9, 2015, brought together a varied group of project participants, including dignitaries, who took part in the ‘blessing of the four corners’, and met the residents while touring the new building. Highlighting the celebratory speeches, formerly homeless residents shared their moving stories and their appreciation for the opportunity to have a permanent place to call home.